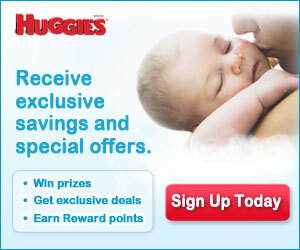 Join Huggies New Moms For Coupons, Advice and More! I remember when I became a mom for the first time. I was nervous, scared and full of questions!! Luckily, there are a lot of great sites which helped answer my questions and put my mind at rest. If you are a first time mom (or mom to be), sign up with Huggies to get access to great tips on how to care for your baby. Not only that, you will also receive access to special offers, including those coveted diapers and wipes coupons! Head over HERE and just fill out the form and hit the red Sign Up Today button. That’s all it takes to join!! !